I never really tried mingle to some of the bloggers on facebook groups but I do belong to more than 10 groups. Now, something struck me with #YOUBLOGYOU post. I tried it and here I am writing 11 things you should know about me blogging. If you're a blogger and you think this is fun, come and join the pack! When I was in highschool I've always kept a planner with me. Yes Planner, I don't plan things out up to date but I do write what happens on that day. I keep my planner as my daily diary. I got tired of handwritten diaries and started to blog about it. I even believed myself that there are at least 2 people who's depressed enough to read something about personal issues and that they can use it for self realization. As what I've mentioned I started blogging when I was in High School. I think it was back in 2009. I use tumblr by just reposting photos and sharing my thoughts about it. Then eventually when I got a little depressed in life (Yeah I was EMO back then....... and I am kidding. ) hahah anyway so yeah I started my personal blog with still in Tumblr, and I think this is still up till now. You can search for it if you want! I started blogging by sharing thoughts, reviews, fashion and lifestyle here in Blogspot. My blog was named "Amazing Things From Terrible Lies" I didn't know how to brand my blog. 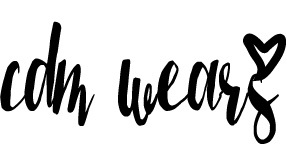 Last 2014 I planned to re-brand to CDMWEARS. 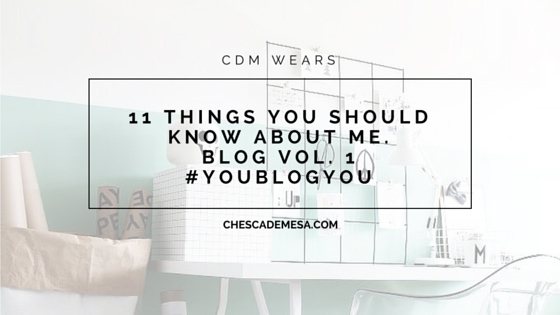 #CDMWEARS started with a Instagram Hashtag. I use this to tag my OOTD's. Then my friends and schoolmates started to call me that and it got stuck in to my head that I even made it my blog name. 3. What's the topic you enjoy blogging the most? The topic I enjoy blogging the most are the events and product review. I love mingling and meeting a lot of people - and that's why I'm a Marketing Manager now. I also enjoy attending events as like trying all the "TRY ME" stuff you see in Department Stores. 4. How long does it usually take you to finish a blog post? I usually finish a blog post in an hour or two - but that depends with my mood and what to blog about. It was easy for me cause I just write down what my mouth wants to say. 5. If you were to name three (3) goals you want your blog to achieve next year, what would it be? 1. Hit a milestone, it doesn't matter how much and how long. 2. Have time to meet the readers in my blog. 3. Have more blogging opportunities. 6. Does your family know about your blogging career? Why or why Not? Yes, my family knows about my blogging career. My dad actually the one who insisted me to buy my own domain them. I get the most support from them especially when I do need to attend events. There some events that are too far that I even had to ask my dad to drop me off. My mom also enjoys the freebies and samples I get from blogging she even helps me to review each of them. 7. Which blog or blogger inspires you the most? The blogger that continuously inspires me is Jessica Ricks of http://www.hapatime.com/ . I was reading her blog since forever! She has a very nice taste when it comes to fashion. I know I will never have the time to get to meet and greet her but hey the world is small. I am still expecting to bump to her one of these days when I started to go traveling. 8. What is the greatest achievement your blog has received? If you haven't got any, what would be the achievement you'd want to receive? The greatest achievement I received was I was a nominee in The Philippine Blogging Awards. I didn't expect my blog to be nominated in the first place. There are over thousand of bloggers around here in the Philippines and I WAS NOMINATED!! 9. What is your best viewed post? Share it with us by providing a hyperlink and a short description about it. Last 2014, I tried writing about the "#BenildeFroshTips" . - It was all about how to get ready to enter the college life in CSB. I wrote this with my own experience, and that I think most of the incoming college students can relate to me. 10. If you were to give out three (3) advises for newbie bloggers, what would it be? 1. Know what content you should provide. Don't put something that is not related to your blog. Your readers visit you because of your content. 2. Don't blog because of the freebies, blog because you have a passion in writing. I always say this, this freebies come and go. YOU HAVE TO EARN IT and YOU HAVE TO GIVE BACK. 3. Know yourself. Blog something that your heart desires but not what your eyes wants. 11. If you were to give out three (3) advises for yourself as a blogger, what would it be? 1. Start proof reading. I don't usually proof read my post because I'm just too excited to click Publish. 2. Do blog scheduling. I do draft post but it's not enough to comply with my busy schedule. 3. Start earning from ads. I don't really have time study how this ads works and how do I put it in my blog, but I am starting to understand how it works now. That's it! Hope you learned something from me! I agree with your answers for number 10. Blogging is never easy so every blogger should know their content, and must have a passion in blogging/writing.